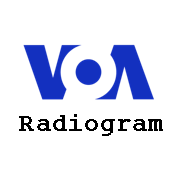 VOA Radiogram for the weekend of 7-8 September 2013 will include more experiments with RSIDs, the brief signals that automatically switch your decoding software to the correct mode. This weekend’s VOA Radiogram will include another transmission in MFSK128. This will be done mainly to see if the RSID works. However, to improve the chances for a successful decode of the very fast MFSK128, it will be in Flamp format. A paragraph will be divided into seven blocks of 64 characters each. And it will be transmitted three times, with the second and third passes filling in any blocks with incorrect checksums. Make sure Flamp is running before the MFSK128 transmission begins; it does not turn on automatically like Flmsg. The foreign language for the weekend will be Spanish, with brief VOA news items in both plain text and Flmsg formatted. Please turn off and restart Fldigi before each of this weekend’s VOA Radiogram broadcasts to ensure the accented Spanish letters display correctly. You will need the UTF-8 character set. The adjustment can be found via Configure > Colors & Fonts. To make Flmsg work with Fldigi, in Fldigi: Configure > Misc > NBEMS — Under Reception of flmsg files, check both boxes, and under that indicate where your Flmsg.exe file is located. There will also be a minute of MFSK32 on The Mighty KBC, via Germany, Saturday at approximately 1130 UTC on 6095 kHz, and Sunday at approximately 0130 UTC on 7375 kHz (Saturday evening 9:30 pm EDT). Also check out their post: Base64 VOA logo via MFSK128: a few unexpected successes. Fascinating! This entry was posted in Broadcasters, News, Shortwave Radio, What's On Shortwave and tagged Digital Text, Kim Elliott, VOA, VOA Radiogram, Voice of America on September 6, 2013 by Thomas. 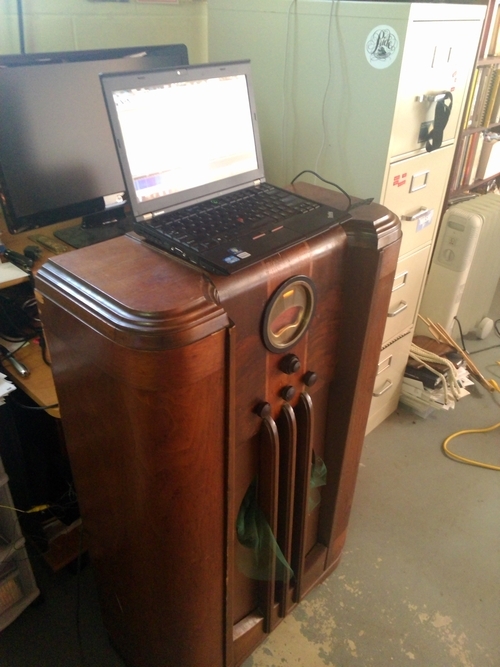 Gerhard, W6XH, recently purchased a vintage 1938 Philco console receiver, then used it to decode a VOA Radiogram. Brilliant! Check out the post on voaradiogram.net. This entry was posted in Boat Anchors, Digital Modes, News, Nostalgia, Radios and tagged Digital Text, Kim Elliott, Philco, VOA, VOA Radiogram, W6XH on August 18, 2013 by Thomas. If you are an EasyPal fan, EasyPal returns this weekend with a striking image of the Las Vegas skyline. Don’t be too disappointed if you cannot decode the EasyPal image. A certain signal threshold is required, and the failure rate is rather high. In recording the program for this weekend, I applied audio compression to my voice introduction and to the music at the end of the show — but not to the digital tones. Perhaps you will notice the difference. *To make Flmsg work with Fldigi (both can be downloaded from w1hkj.com), in Flmsg: Configure > Misc > NBEMS — Under Reception of flmsg files, check both boxes, and under that indicate where your Flmsg.exe file is located. **Download EasyPal software from vk4aes.com. 1) Audio samples of poor reception which nevertheless results in a successful decoding of the text modes. 2) Reception of the digital modes on less expensive portable radios, and any advice you have on how to feed audio from those radios to your PC and the decoding software. This entry was posted in Broadcasters, Digital Modes, What's On Shortwave and tagged Digital Text, Digital Text over Shortwave, Kim Elliott, VOA, VOA Radiogram on August 2, 2013 by Thomas.